Everything included in model, plus the Video Course. The course is targeted for beginners to financial modeling that want to learn the concepts of how to create a financial model. The video course is not a “how-to” for the model, but a deep dive into the fundamentals of building a financial model for startups in general. The course is viewed on this site by creating an account after purchase, preview here. Course is sold for $99 on its own, only $50 in package with a model. Everything included in model, plus the Get Started support option. 1 Hour of assistance in completing the model, customization and review. Focus is on structuring and adjusting inputs for your business, and refining unit economics, cost budget, financial statements, and financing strategy. Can be purchased separately later. Additional customization may be necessary depending on your business; to be determined and billed separately. 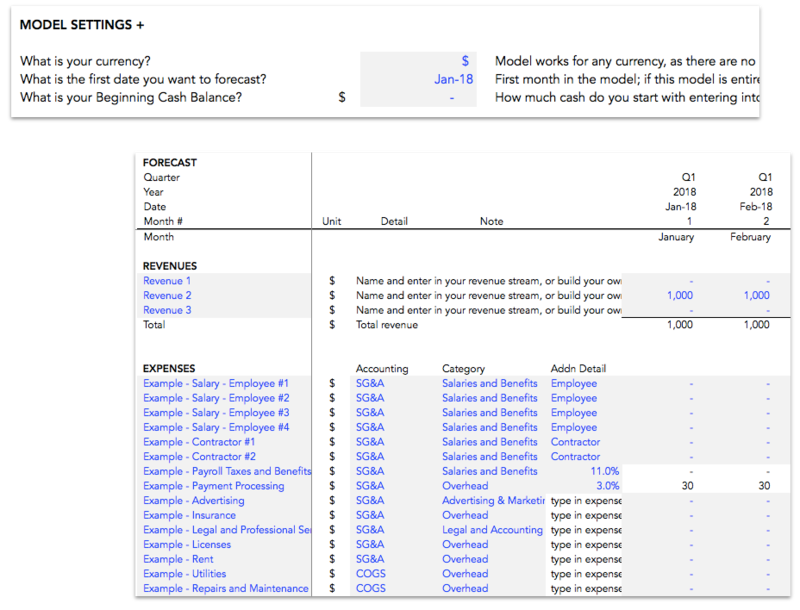 Three year financial model template for Excel or Google Sheets with prebuilt three statements - consolidated income statement, balance sheet, and statement of cash flows - and key charts, summaries, and metrics. Used by idea-stage, pre-seed, and seed stage companies. Add in your own revenue forecasts. Unlocked - edit anything - last updated in January 2019. 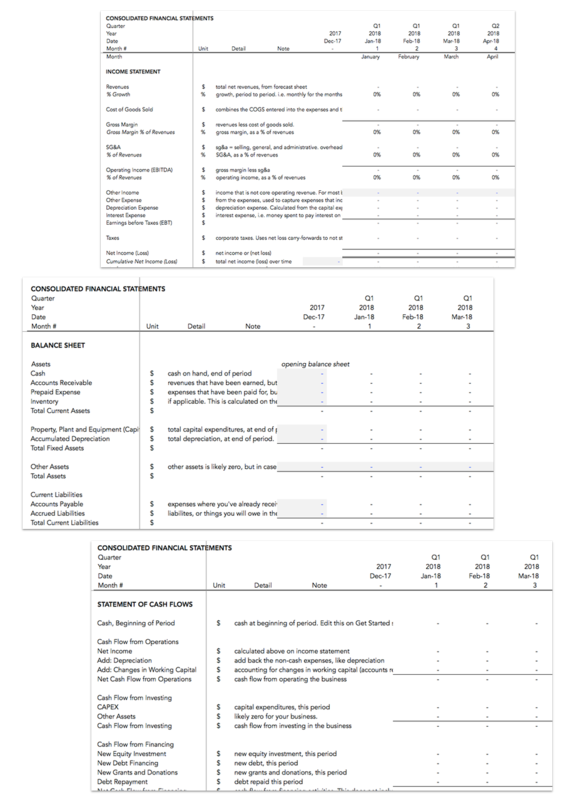 Three year financial model template for fundraising and business planning for startups and entrepreneurs. Forecast revenues, operating expenses, cash and runway, financial statements, funding needs, and more. Made for founders, executives — CEO, CFO, COO, VP of Finance — or advisors, mentors, or consultants that need to create a financial model for an idea-stage, pre-seed, seed, A, or B stage company. 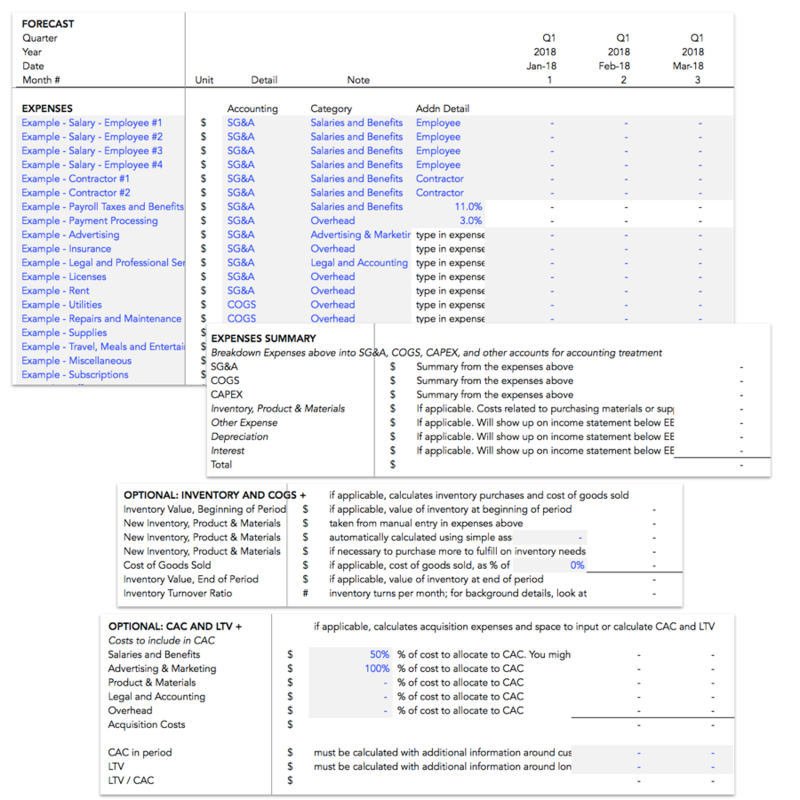 Statements: Line 47, edited formula to include the two lines not included in the original formula, to sum all the current assets. Statements: Line 86, removed change in other assets from change in working capital, and Forecast: Line 98, included change in other assets. Net/net, this shifts how changes in other assets are treated to make it more consistent from an accounting perspective. If you are not using the Other Assets line on your balance sheet, this has no impact. Statements, G114 to G116: Edited the first cell so that it calculates the % from the opening balance sheet automatically, just to save a little time. Feel free to change the methodology to fit your business. I build standards-based, rock solid financial models to solve real business problems. Here’s what’s inside the Starter Financial Model. The structure is designed to be easy to extend by adding in additional detail or advanced methods for forecasting growth, revenues, and costs for specific business types. The core of the model creates monthly forecasts for up to 36 months, which are then automatically summed into quarters and years. All cells and formulas are completely open and unlocked, so you can edit or change anything in the model. Inputs and calculations are clearly labeled, making it easy to see where to input numbers in the model. Complete flexibility to create a revenue forecast by any method you desire. 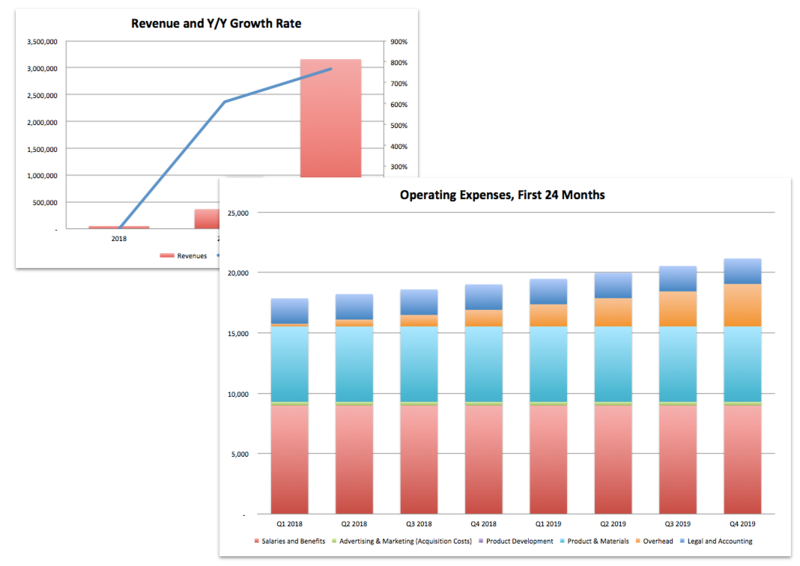 The Starter Model simply has inputs for revenues, and no prebuilt business logic for forecasting revenues. 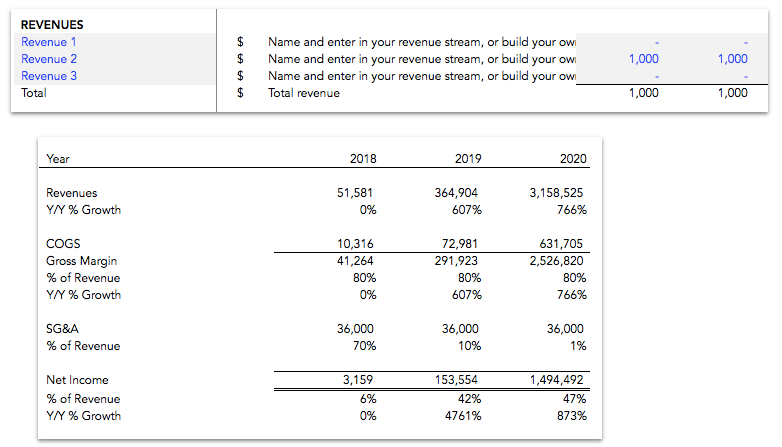 For many early-stage entrepreneurs that do not have solid data or complicated revenue models, the simplicity is a benefit and makes it easier to build in any revenue forecast methodology. Simple yet robust methodology for creating a cost budget by month, quarter, and years, for up to three years and an optional partial year. Build a detailed hiring plan by adding in employees and contractors, monthly salaries and when they are hired. Flexible inputs to input all costs easily on a month by month basis. Expenses can be allocated to key expense areas for reporting and analysis, and select the accounting treatment with a simple dropdown selection. Optionally, model inventory purchases and cost of sales based on forecasted sales, inventory turnover ratio, and minimum order quantity. Optionally, calculate CAC and LTV using the data in the model. Consolidated financial statements, including income statement, balance sheet, and statement of cash flows, all monthly, quarterly, and annually. The statements are automatically created through the revenue and costs forecasts in the model. Model automatically uses the forecasted revenues and expenses to create a chart showing net loss, net profit, cash on hand, and breakeven, to easily communicate runway and burn. Enter external fundings - e.g. equity, debt, grants) - and model automatically handles balance sheet and cash flow treatment, including automatically creating schedules of principal and interest payments, if debt. Prebuilt summaries and key reports that provide key performance metrics at a glance. Summarized annual income statement and cash flows are prebuilt for easy sharing in financial and investor presentations. Sources & Uses: A summary pie chart that shows how the first fundraise - external financing - you put in the model (optional) is used to pay for the summary operating expenses over a period of time. 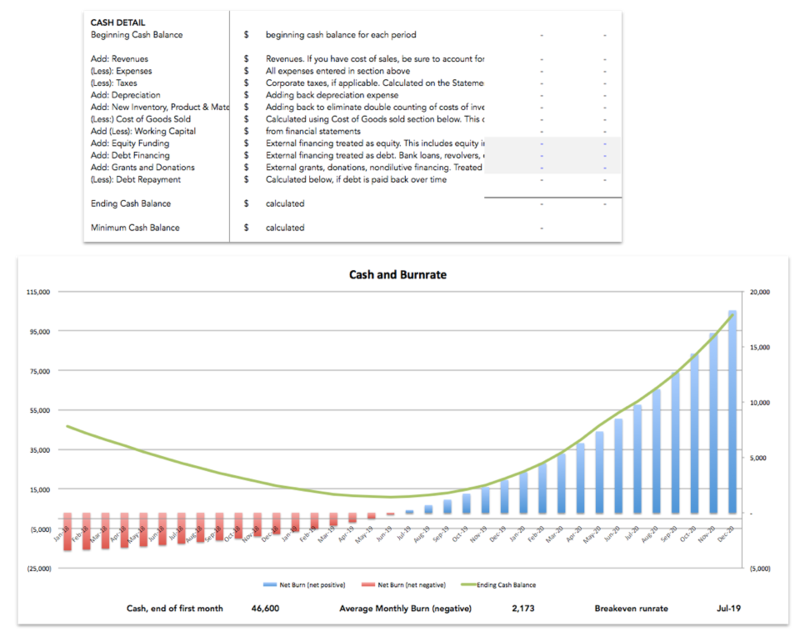 Here are two options if you need a model with more detailed revenue forecasting - the Standard - or a free option with less detail, the Runway and Cash Tool. The base model for entrepreneurs of all stages to create five year forecasts, with consolidated financial statements, funding forecasts, cap tables, and returns to investors. Prebuilt to handle many types of businesses, including ecommerce, SaaS, marketplaces, advertising businesses, subscription services, retail, hardware, hardware and subscription services, consulting businesses, apps, and mixtures of different business models. 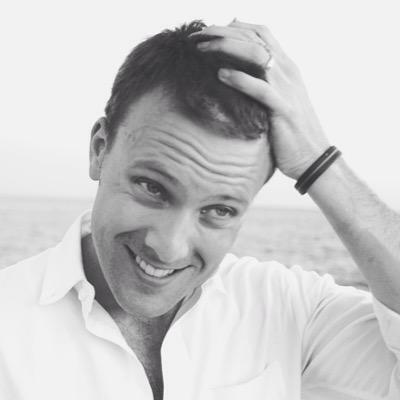 Good for pre-seed and seed stage entrepreneurs that want to create three year forecasts, with a hiring plan, cost budget, consolidated financial statements, and key reports. Does not include prebuilt revenue model, cap table, or valuation. This can be a great option for companies that have less data or clarity around their revenue projections, or want to easily build in their own methodologies for forecasting growth and revenues. A free model that provides the structure to create a hiring plan, cost budget, summary, and key reports. Good for entrepreneurs that want to create a cost budget, analyze their burn and runway, with the minimal amount of modeling. How do the Foundation models compare? All Foresight models are built to solve for the same problem - creating a forecast for a business - but with different levels of detail, to acknowledge the needs of enterpreneurs at different stages. All models use the same core structure, making upgrading between models easy in the majority of cases. My general rule is to start with the model that has less detail - just enough to accomplish what you need - and then either build in what you need (all cells and formulas are unlocked) or upgrade to a more advanced model with more features prebuilt. Below are the key differences between the Foundation models. We’ll do a 15 minute screenshare or call to talk about your needs and walk you through the Starter Financial Model (or others) to help figure out the right solution for you.